Tyrus Wong was a Chinese-born American artist. He was a painter, muralist, lithographer, designer and kite maker.Nearly all of America, if not the world, has seen his work, and most likely has been deeply moved by it. But few could tell you his name.Even fewer are aware of the impact his work has had, and continues to have, on American art and popular culture. He was America's oldest living Chinese American Artist and one of the last artists from the Golden Age of Disney Animation. ''Tyrus Wong's story is a prime example of one of the many gaping holes in our society's narrative on art, cinema, and Western history . By telling his story, I hope to shine light on one of America's unsung heroes, and to raise awareness of the vital contributions he's made to American culture'', -explains filmmaker Pamela Tom. Tyrus Wong was born in Canton (now Guangzhou), China in1910, right before the fall of the Chinese Empire. In 1919, he and his father immigrate to America, never to see their family again. Like other Chinese immigrants, Tyrus’s adventure to the “Gold Mountain” begins in a locked cell at the Angel Island Immigration Station, where a frightened nine-year-old Tyrus is interrogated for over a month. It's a time of miserable suffering, yet it doesn't break Tyrus's spirit.“As a descendant of an Angel Island paper son, I know that the real story is not just what the immigrant experienced on the island, but what the immigrant accomplished afterwards. Because the art of Tyrus Wong has touched so many people, I saw his story as “Exhibit A” to illustrate the contribution of Asian immigrants in America,”notes executive producer Buck Gee. Tyrus's only interests are to paint and draw. Too broke to afford ink and paper, his father fosters his son's artistic talents by having Tyrus practice calligraphy by dipping brushes in water and leaving an impression on old newspapers. Although he is a self-proclaimed “lousy student,” Tyrus earns a scholarship from the Otis Art Institute while in junior high school and also takes advantage of the nearby Los Angeles Central Library, where he studies the art of the Sung Dynasty in his free time. But it isn’t an entirely academic, intellectual path: Tyrus takes on a number of odd jobs to make ends meet, from serving as a waiter in the bohemian underground Chinatown restaurant Dragon's Den to picking asparagus in the fields. The plight of the Chinese was very different in the early 1900s. There were fewer opportunities because of many obstacles. Despite this, Tyrus was able to preserve and develop his artistic skills. I admire Tyrus Wong for his tenacity, hard work and conviction in what he believes, and I feel it is our obligation to see that his story is preserved for future generations", says executive producer Robert Louie. After graduating from Otis Art Institute, Tyrus experiences a meteoric rise as a young modernist painter: he participates in an exhibition at the Chicago Art Institute alongside Pablo Picasso and Henri Matisse in 1932, and later mounts shows in New York and Paris. Closer to home in Los-Angeles, he and his fellow artists Hideo Date and Benji Okubo draw the interest and attention of critics and curators as they begin to shape the cultural and artistic life of Los-Angeles. Influenced both by Asian roots and western art training, these ''Los-Angeles Orientalists'' leave an indelible mark on the Southern California artistic landscape during the 1930s and 1940s. ''Despite Americans mistreatment of Asian immigrants, the American public, ironically, very receptive ti their art'', says Tom. After parting with Disney following the notorious artists, strike in 1941, Tyrus goes to work in the live-action realm at Warner Bros for more than a quarter decade. He serves as a visual concept artist on over one hundred live-action films including The Wild Bunch, Rebel Without a Cause, Sands of Iwo Jima, PT 109 and April in Paris. Later in his commerical art career, Tyrus designs greeting cards for Halmark, and one of his Christmas card designs sells over 1 million copies. "Tyrus was one of the very first Chinese Americans to make living in the world of art and film, which was especially notable in an era when minorities were virtually shut out of Hollywood,'' explains Tom. As time will tell, Tyrus isn't just making a living, he's making history, and in 2001, is honored as such by being named a Disney Legend. Retrospectives of his work appear at the Walt Disney Family Museum in San Francisco and at the Museum of Chinese in America in New York City. On the personal side, Tyrus enjoyed a half-century of marriage to Ruth Kim, and fatherhood to three daughters; Kay, Tai-LIng and Kim. Surrounded by family and a coterie of fans, Tyrus launched his fanciful creations -100-foot long centipedes, butterflies, panda bears, and flocks pf cranes and swallows-skyward. There they soar high above the Pacific Ocean - the same ocean Tyrus crossed as a young boy 95 years ago. 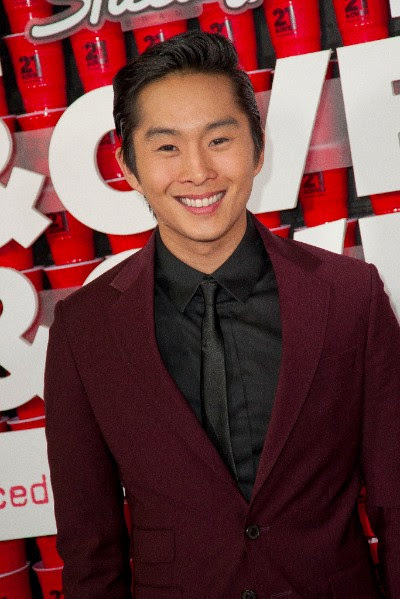 Justin Chon is the star of the current independent films Man-Up, which he also produced and wrote, and Seoul Searching. He is also one of the stars of the Yahoo basketball series Sin City Saints. Chon has also just completed a starring role in the feature horror film Satanic. He can be currently seen in DramaWorld for Viki. Last year, he starred with Ray Liotta in the Martin Scorsese executive-produced feature Revenge of the Green Dragons and fans will recognize him from his starring role in the comedy feature 21 and Over (from the creators of The Hangover) and as Eric Yorkie in The Twilight Saga film series. Chon is known worldwide by film audiences for his role as Eric Yorkie in Twillight Saga: New Moon, the Twilight Saga: Eclipse and The Twilight Saga: Breaking Dawn. In 2009, he had supporting role in the Weinstein Company Feature Film, Crossing Over. The film, directed by Wayne Kramer, also stars Harrison Ford, Ray Liotta and Ashley Judd. Born and raised in Southern California, Chon's parents migrated from South Korea where his father was a well-known television and film actor and his mother was an accomplished pianist.